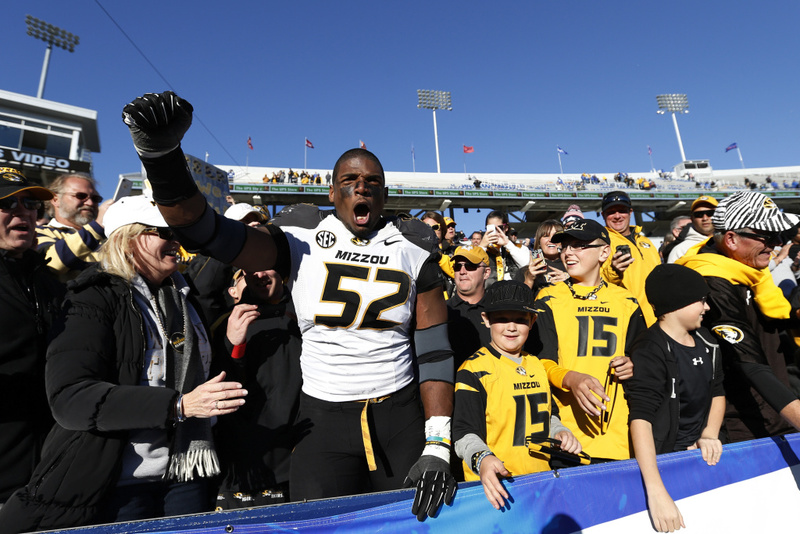 Michael Sam #52 of the Missouri Tigers celebrates with fans after the game against the Kentucky Wildcats at Commonwealth Stadium on November 9, 2013 in Lexington, Kentucky. Missouri won 48-17. It's time for sports with Andy and Brian Kamenetzky, who have covered the sports scene for ESPN and the L.A. Times. The week started with Missouri star defensive end Michael Sam announcing his is gay. Now, the fallout. Let's start with the timing, three months away from the NFL Draft. We're all in new territory with all this but what do you think? Good time? Bad time? Or no time would have been perfect? Now, it's one thing to come out to a world full of strangers, but telling your family is another thing and that doesn't sound like it went well for Michael Sam. Moving to the NBA, where Lebron James was asked a question to which he gave a very interesting and debatable answer. This past weekend, Oklahoma State guard Marcus Smart tumbled out of bounds trying to block a shot. When he got up he exchanged words with a fan before shoving him, resulting in a suspension. Smart and the fan both apologized to each other. What does the price of admission to a sporting event buy a fan? Boo? Trash-talk?